Ballina Town saw both Benny Lavelle and Jamie Cawley both bag four goals each, with Dylan Edwards scoring a hat-trick and single strikes from Duane Helly and Dylan McKee rounding off the scoring for Mick Duffy's men. Ballina's ability to find the back of the net has been the deciding factor this season, hitting 73 goals to date, with three games to go. 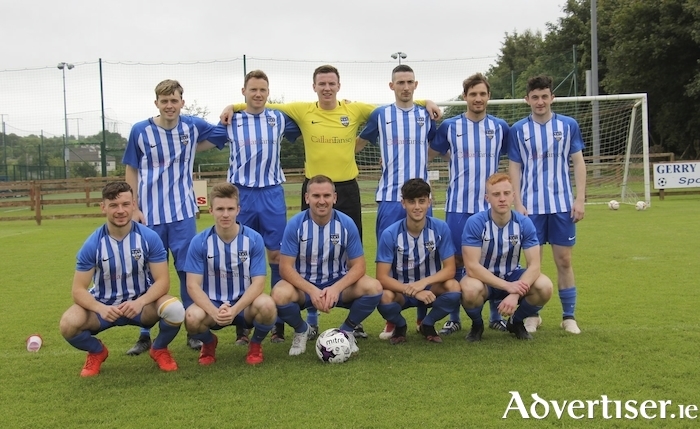 Westport United kept themselves in second place thanks to a 4-3 win over Manulla in Carramore, the visitors had trailed 3-1 early on with a Paul Lawless brace and Jackson DeSilva hitting the back of the net for Manulla. Jasper Frisch had opened the scoring for Westport before Manulla hit their stride, but United came strong with Darren Browne bagging one either side of the break and Mickey O'Brien grabbing the winner deep in injury time. Just behind United in third place are Castlebar Celtic who had a 4-1 win over Straide and Foxford United in Celtic Park. The Hoops' went in 2-0 up at the break with Gerry Hunt hitting the back of the net twice. Straide and Foxford hit back through a Paul Moran strike, before Jose Navarro and Nicky Canning rounded off the win with second half goals. Claremorris stand in fourth place after seeing off Iorras Aontaithe 5-2 in Concannon Park. They had trailed 1-0 at the break after Ivan Barrett hit the net for the visitors. But in the second half Danny Broderick scored twice and goals from Andy Peters, Cathal Walsh and Finnian Brady saw Claremorris romp home, with Tom McAndrew grabbing the second goal for the relegation threatened north Mayo men. Ballyglass moved into mid-table safety with a 5-0 win over Kiltimagh/Knock where JP O’Gorman was the main man bagging four goals with the other one coming from Evan Connolly. Snugboro United moved a step closer to promotion to the Super League and the Premier League title - with a 2-0 win over Fahy Rovers thanks to Sean and Kevin Curry. This weekend could see the Boro' crowned champions if they see off Bangor Hibs as expected and second place Ballyhaunis Town drop points to Fahy Rovers. Ballyhaunis Town had a 4-2 win over Conn Rangers last time out, goals from Cathal Carney (2 ), Jarlath Carney and Dayo Adex were on target for the east Mayo men who made it six league wins in a row. Swinford kept their promotion hopes alive with a 4-2 win over Achill Rovers. Paddy O’Donnell put Swinford into the lead early on but Achill went in ahead at the break after two goals from Brandon McGing and Damien McNulty. The promotion chasers came away with all three points thanks to a Joe Slevin brace and Martin Murphy. In the battle at the bottom, Westport United B who are rock bottom of the division seriously hampered Ballyglass B's hopes of avoiding the drop with a 1-0 win, which is leaving them in a very perilous position with just three games to go. Ballina Town B were crowned League One champions after their 2-1 win over Partry Athletic in Belleek. Eric Monk gave them the lead before Partry levelled the game before half time. Dale Hopkins bagged the winner for Town halfway through the second half. That goal sealed the title for his side and they claimed the double after already picking up the Tonra Cup. Castlebar Celtic B inflicted a 3-1 defeat on Manulla B to deny their neighbours the league title, with this result combined with Ballina Town B's win sending the title to north Mayo. Kilmore were relegated to League Two after they were held to a 2-2 draw by Killala.